Funtober lists the best Halloween haunted houses in New Mexico. We have all the 2018 commercial and charity haunted houses, haunted trails, haunted corn mazes, and scream parks in October. Plan a night out with your friends to find some zombies, creatures, vampires, and witches running about the state. Expect to see Hollywood type set designs, air blasters, live actors, and professional makeup. Also check out our list of the Top 100 Haunted Houses 2017 in America. Is your favorite haunted attraction on the top 10 and top 100 state list? Haunted House Owner? Advertise Here. Do you run a haunted house in the United States? More than 500,000 people came to Funtober last year looking for a haunted attraction to attend in the fall. Please see our advertising page or contact us for more information. 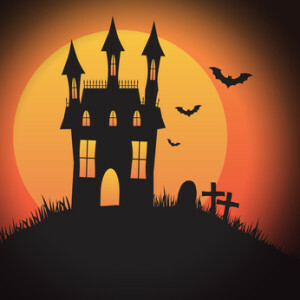 We have separate attraction links and listings for haunted houses USA, haunted corn mazes, haunted trails, haunted zombie paintball, haunted forests, haunted hayrides, and ghost tours. Annual charity event hosted by Carlsbad Mall and put on by the local downtown Lions Club and Carlsbad High School Mummers (a local theater group). Small $5 donations accepted. Back again at the State Fairgrounds Expo hall for 2018. It is open every Tuesday through Sunday in October. The scary event opens at 7 pm. Friday and Saturday it closes at 12 am, Sunday nights at 9 pm, and at 10 pm on all other nights. Michael, Jason, Pumpkinhead, and Clown Butcher are back to give you terrifying scares. Open from October 4th through November 3rd. Farmer McCall still roams the fields with his axe looking for more victims. McCall’s is open Friday and Saturday nights starting September 28th through October. Doors open at 7 pm. The haunt attractions are The Haunted Cornfield and The Haunted Barn. Tickets are priced for a single haunt or a double haunt ticket. Lots of activities and party type atmosphere every night at McCall’s. Pay a small fee $4.95 to enter the facility and join in the fun without actually paying to go through a scary haunt. Attraction is all updated for 2018. This haunted attraction will not open in 2018. Hosted by Blackout Theater. An all new theme and all new scares in this 12,000 square foot scare attraction. Open most nights in October 2018. A really scary place opens in October. Opens beginning October 12th and runs through October 31st. The season begins on October 5th. Doors open at 6 pm. A low scare runs generally from 6 pm to 7 pm. Full scare starts at 7 pm. Attraction runs Friday and Saturday nights plus a number of additional October dates. General Admission tickets run $25 or low scare $20. You should expect this to be very scary. They even have a one night forfeit attraction that most people can’t make it through. Consider this an extreme haunt. If you are on the border with another state, your closest haunted house might not be in New Mexico. Also check these bordering states for more haunted attractions. Have you bought a ticket to one of these haunted houses? Future visitors would be interested in hearing what you thought. Did you have fun? Was it worth the money? Would you recommend it to our readers? Any suggestions to maximize the experience? I’ll gladly publish what you send me and give you a virtual hug. If you are the owner or employee of a haunted house on this list, or one I missed and need to add, I would love to have more information about the haunted house, photos, dates/times/hours for 2018, etc. Use the contact form to get in touch and I’ll tell you where to email your answers to these questions. For the past several years we’ve made the long drive out to McCall’s Haunted Barn because it is SO GOOD! We stood in line for at least 1.5 hours each time, with the teenagers (we’re 30’s-40’s!) and got our pants scared off both times. I don’t think we’re going back this year just because the wait is so long and it’s such a long wait. I think we’ll try the Haunted Scarecrow to see if that’s scary enough and we don’t have to wait so long. PSL Season is Almost Here! Your home can smell like fall with B&BW’s new fall candles! Welcome to Funtober. We help millions of people have more fun in fall by listing local fall festivals, pumpkin patches, corn mazes, apple orchards, haunted houses, ghost tours, Halloween events and Black Friday deals. We provide hundreds of different costume ideas and thousands of different Halloween costume options. Funtober is a participant in the Amazon Services LLC Associates Program, an affiliate advertising program designed to provide a means for us to earn fees by linking to Amazon.com and affiliated sites.